In the four decades since the marriage bar was controversially lifted, women have flowed into the Irish workforce. At the moment there are nearly one million Irish women out at work, about half of whom have children. What interested Dr Clare O’Hagan, though, is that in the 42 years since the bar was lifted in 1973, nobody had done any research on the impact of this phenomenal trend on women and their families. Yet, “families with a male breadwinner make up less than one-third of all families now,” points out O’Hagan, a research fellow in gender equality in the University of Limerick. O’Hagan only realised the extent of the dearth of research on the area when she started work on a Master’s degree – in fact so little attention had been given to the topic that she decided to pursue it to PhD level. Her findings are less than reassuring: “what I found is that women are divided and conquered.” Women attempting to combine motherhood with paid work are a silent majority, says O’Hagan, blaming themselves for poor choices rather than a system, which sets clear and defined limits to the choices available in the first place. Her book charts the difficulty and futility of making super-human efforts to be a ‘working mother’, because motherhood and employment are irreconcilable as currently constructed in Irish society. In Ireland as elsewhere, O’Hagan points out, changes in the male breadwinner model with women’s participation in paid work, have not been matched by changes in society, policy and the economy. Policies for supporting unpaid care work are undeveloped compared with job creation measures. It resulted, she recalls, in an incredible explosion of discussion, anecdotes and opinion. The practical issues of finding appropriate childcare were endless, it seemed and left up to women to resolve without any support from a completely disinterested State. The women had all chosen different ways of combining motherhood with paid work. “They participated in my research to see if there was a right way of being a working mother, but what we found was there is no established path.” Childcare arrangements are arbitrary and ad hoc. “Everyone is ploughing their own furrow,” she explains, adding that some women had reduced their hours, while some stayed on full-time. All were seeking the right way, the holy grail of childcare she explains and often blamed themselves and other women for their failure to find it. Those for whom things fall into place rightly consider themselves lucky while those whose often ad hoc childcare arrangements don’t work out properly, can unfairly blame themselves. The reason for this, she says is simple – the lack of a properly resourced State-organised childcare service and a lack of recognition for people who are childcare workers. Denmark, for example has a universal system of childcare where costs are capped, and the resources are in place to facilitate this. In Ireland, however, we don’t have the resources, the service or the value placed on childcare to facilitate people going out to work. That image persists, even though it does not reflect reality any more,” O’Hagan declares. Yet she points out, women still measure themselves against that homemaker role, while even the primary school system clings to that expectation in terms of how the year is planned. “There is a failure of the state in terms of the fact that caring work is not valued or provided,” she says, adding that during her research she heard several anecdotes about women who had to give up their jobs because of the lack of satisfactory childcare arrangements. “The government has recently set up a commission or working group to look at childcare, but they should not look at it in terms of cost, or in terms of job creation. “Their focus should be on childcare as a social good,” she declares, adding that a system must be put in place to recognise and adequately reward those who take on the role of care workers. However, there’s no social policy to cover it and women need to locate that care in terms of child or elder care. “Many women are working whilst also caring for children and elderly parents and the choices that they are being forced to make are not “free” choices” she warns, with the results that women are left feeling guilty, stressed and rushed. “They feel they are not properly able to reconcile work and family life so they are compromising and trading off all the time”. On top of this, workplaces and employers behave as if they have no caring responsibility, and that, combined with the lack of state infrastructure for either employers or parents means that women are basically attempting to make possible the impossible. 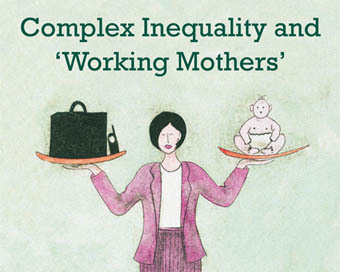 Complex Inequality and ‘Working Mothers’ by Clare O’Hagan is available to purchase now.